CHEMANIUS, BC – Riot Brewing has announced the upcoming release of a beer born out of a near disaster that struck the brewery last month. Due to the record-setting windstorms that hit the coast of British Columbia in late December, Riot lost power just as a 2,000 litre batch of beer was about to be boiled. With some quick thinking, the brewers pitched some Lactobacillus to sour the wort at room temperature, and started the boil when power was restored three days later, hoping for the best. Luckily, the experiment was successful, and following the addition of several other ingredients, Sour Outage Passionfruit Plum Dark Sour (4.5% abv, 6 IBU) was deemed ready for release. 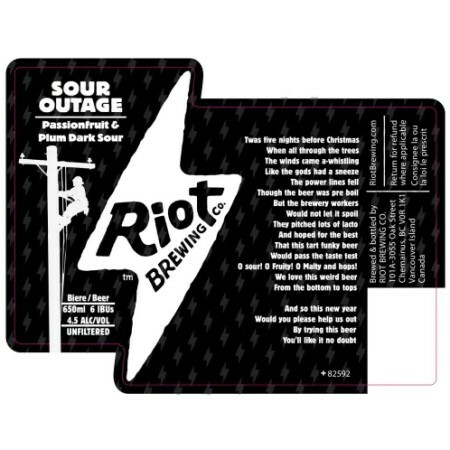 Wholesale orders for Sour Outage are already sold out, and the limited release will be available later this month in 650 ml bottles at select liquor stores and the brewery while supplies last.